When I worked in television news, I loved it when my assignment editor gave me a feature story to report for the nightly news. I loved meeting new people, and seeing their talents blossom on the small screen. Unfortunately, features didn’t come my way too often because the station felt that hard news was more important to the viewer. That may be true, but my personality and interests are definitely still in the soft news category, and I prefer to leave the hard news to another reporter. Now that I own my blog, and don’t have to answer to an assignment editor or news director, feature stories can lead my blog news. My goal is to spread some good news, and introduce you to some of my talented and savvy friends along the way. Jennifer Juniper of Pittsburgh, Pennsylvania is the first artist and blogger I met when I started the Hines-Sight Blog last month. I know what you are thinking! Juniper does sound like an unusual last name, doesn’t it? Of course, I had to ask her about it. Jennifer told me that she chose Jennifer Juniper as her "artistic blogger" name because it is from a song that her mother used to sing to her when she was a little girl. If you are a true music whiz then you may know that the name Jennifer Juniper is also the title of the 1968 single by Scottish singer-songwriter Donavan. This catchy tune topped the charts in both the UK and US. Each refrain ends with, “What ya doing, Jennifer, my love? This Jennifer, who is my new talented and savvy friend, grew up to be a busy wife and mom to three boys (aged 12, 9, and 8), and in between her chauffeuring, housework, project directing, personal shopping, and cooking, she is an artist “floating in a sea of testosterone that she calls home,”as she told me. 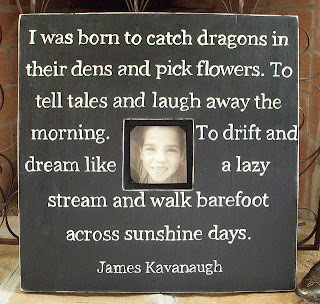 In her little spare time, this creative, impulsive, and witty mom designs and creates custom frames. “I am a wife and mom first and artist second, so my frames are completed during my extra time,” remarked Jennifer. Her creations started simply because Jennifer needed to stick to her family budget. According to her, “A friend and I were in a boutique ‘inspiration shopping' and I saw a box on the wall with a quote about boys that I fell in love with. 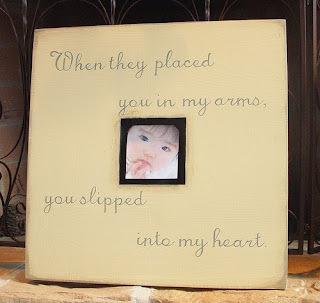 The price was more than I could afford so I went home and tried to figure out an alternative.” Savvy Jennifer used a scrap piece of plywood and some cardboard for her very first frame. 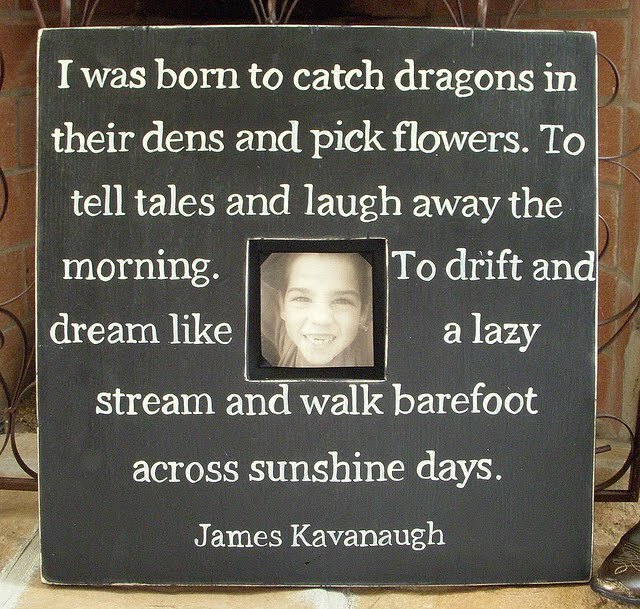 The inspirational frame with a quote by James Kavanaugh was one of the first ones she made, and she continues to display it proudly in her home to remember how she got her creative start. Once family and friends saw her enormous talents, they started asking for their own frames. After some encouragement from others, she decided to sale her first frame on Ebay. A few short months later, she opened Hope Studios on Etsy. Jennifer’s frames are created 100 percent from scratch. 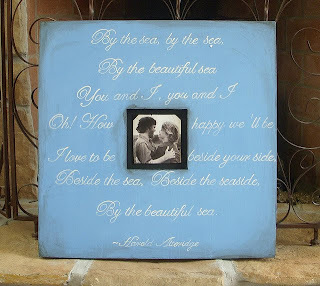 She hand paints and distresses each frame to the desired look then paints the quote by hand with an ordinary paint brush. She does not airbrush or stencil any part of the frame. 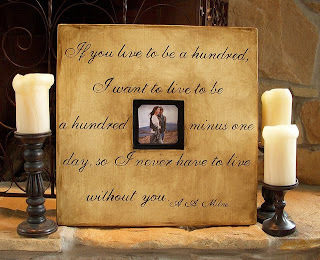 Her frames are custom-ordered so usually there is a special meaning by each quote for her customers. 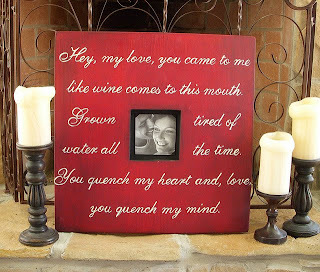 Her first red frame was created for a groom who wanted to give his bride a special present for their wedding day. Red is now one of her favorite colors in her frame gallery. Of course, being a Carolina girl, I’m fond of the blue frames. 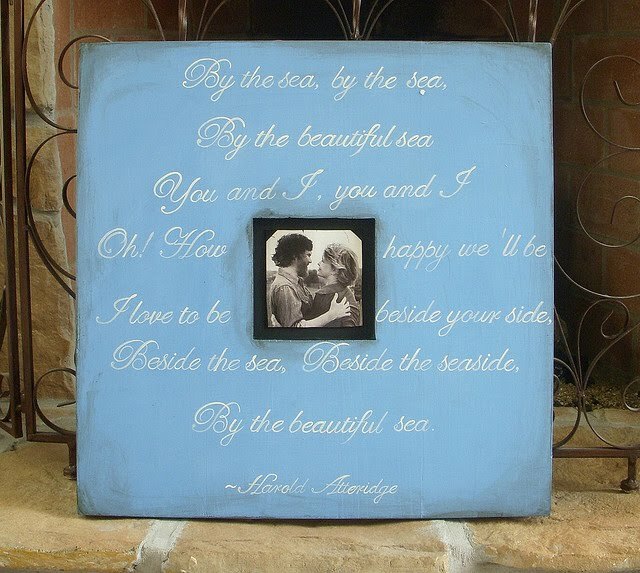 This particular frame was part of a charity auction to fund a child’s healthcare bills in Jennifer’s hometown. Jennifer works with her clients to create the perfect inspiration for them. Her most popular frame features a quote from A.A Milne. She says she has made this frame at least 100 times and she tries to keep some in stock for customers to order immediately. Finding time for her creativity isn’t easy, “I would say the balancing act is delicate and I’m not ashamed to say that the first thing to fall through the cracks is housework. I just can’t stand that hamster wheel of repeating the same task every single day/week! It is my weak point, but I always try to never let time with my husband, kids or dinner fall by the wayside." Jennifer also makes time for family travels, too. 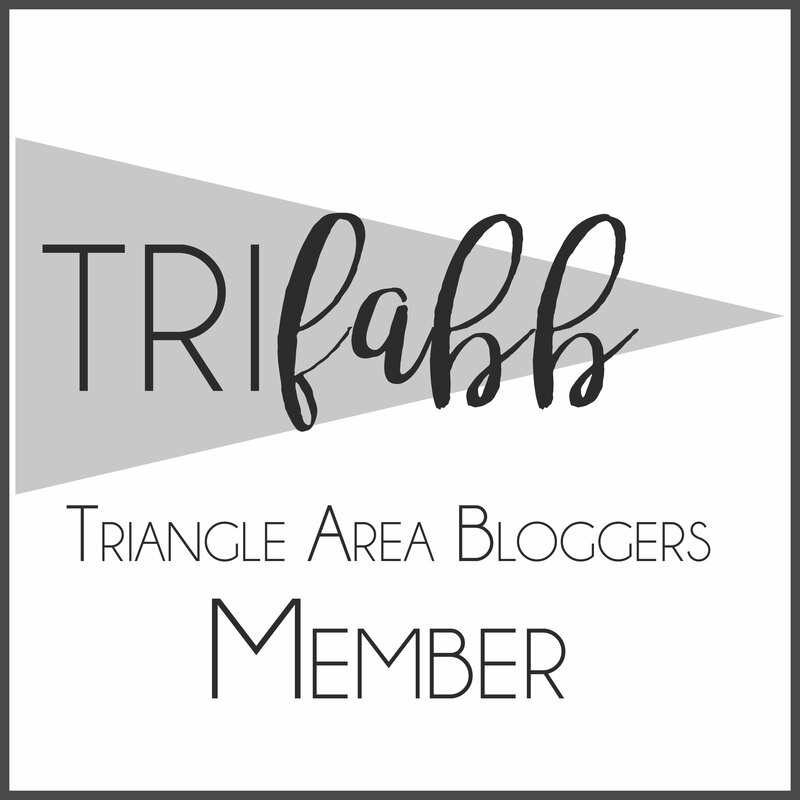 You know this wouldn’t be the Hines-Sight Blog, if I didn’t ask Jennifer about her favorite hotel experience or vacation spot. Like most, she finds some inspiration in her travels and some of those thoughts may just end up on one of her frames in the future. Her family likes to vacation in Stone Harbor, New Jersey. 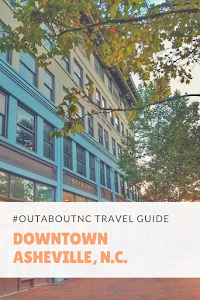 She says, “It’s close enough to drive, the beaches are clean, and the town is very family oriented.” Her family has been going to this vacation spot for eleven years, and rents a vacation home there. I agree that the tranquil, blue sea would be a great muse for an artist. Jennifer, you live in a house filled with boys so you’re used to a lot of blue, but how about adding some pink? As a parent, I fell in love with this frame and I think it would be beautiful in PINK and BLUE, too. I’m so glad to call you my new savvy and talented friend! 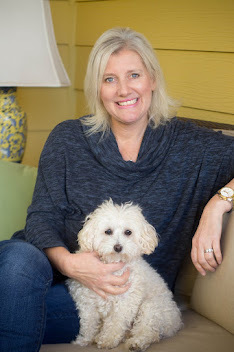 You can learn even more about Jennifer by following her blog. Until next time, I’m off to get a cup of tea for my writing inspiration. If you have a savvy and talented friend who you would like to read about on the Hines-Sight blog, then tell me about them on my Hines-Sight Blog facebook page. Don't forget to follow the Hines-Sight Blog on Facebook. What are you waiting for? Join us! You'll have some fun.